This article aims to address the question: how does your digital camera's sensor size influence different types of photography? Your choice of sensor size is analogous to choosing between 35 mm, medium format and large format film cameras — with a few notable differences unique to digital technology. Much confusion often arises on this topic because there are both so many different size options, and so many trade-offs relating to depth of field, image noise, diffraction, cost and size/weight. 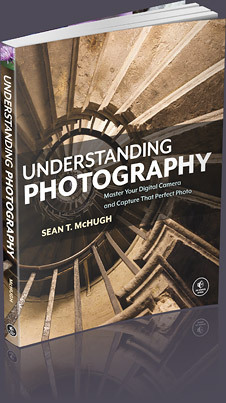 Background reading on this topic can be found in the tutorial on digital camera sensors. Canon's 1Ds/5D and Nikon D3 series are the most common full frame sensors. Canon cameras such as the Rebel/60D/7D all have a 1.6X crop factor, whereas mainstream Nikon SLR cameras have a 1.5X crop factor. 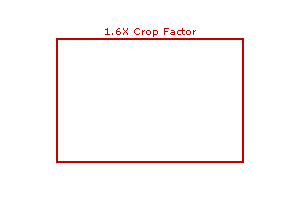 The above chart excludes the 1.3X crop factor, which is used in Canon's 1D series cameras. 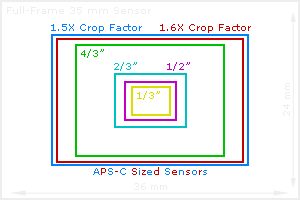 Camera phones and other compact cameras use sensor sizes in the range of ~1/4" to 2/3". Olympus, Fuji and Kodak all teamed up to create a standard 4/3 system, which has a 2X crop factor compared to 35 mm film. Medium format and larger sensors exist, however these are far less common and currently prohibitively expensive. These will thus not be addressed here specifically, but the same principles still apply. The crop factor is the sensor's diagonal size compared to a full-frame 35 mm sensor. It is called this because when using a 35 mm lens, such a sensor effectively crops out this much of the image at its exterior (due to its limited size). One might initially think that throwing away image information is never ideal, however it does have its advantages. Nearly all lenses are sharpest at their centers, while quality degrades progressively toward to the edges. This means that a cropped sensor effectively discards the lowest quality portions of the image, which is quite useful when using low quality lenses (as these typically have the worst edge quality). On the other hand, this also means that one is carrying a much larger lens than is necessary — a factor particularly relevant to those carrying their camera for extended periods of time (see section below). Ideally, one would use nearly all image light transmitted from the lens, and this lens would be of high enough quality that its change in sharpness would be negligible towards its edges. 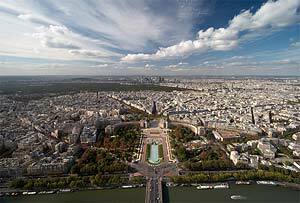 Additionally, the optical performance of wide angle lenses is rarely as good as longer focal lengths. Since a cropped sensor is forced to use a wider angle lens to produce the same angle of view as a larger sensor, this can degrade quality. 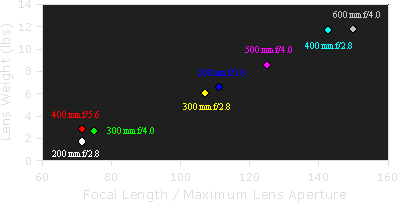 Smaller sensors also enlarge the center region of the lens more, so its resolution limit is likely to be more apparent for lower quality lenses. See the tutorial on camera lens quality for more on this. Similarly, the focal length multiplier relates the focal length of a lens used on a smaller format to a 35 mm lens producing an equivalent angle of view, and is equal to the crop factor. This means that a 50 mm lens used on a sensor with a 1.6X crop factor would produce the same field of view as a 1.6 x 50 = 80 mm lens on a 35 mm full frame sensor. Be warned that both of these terms can be somewhat misleading. The lens focal length does not change just because a lens is used on a different sized sensor — just its angle of view. A 50 mm lens is always a 50 mm lens, regardless of the sensor type. At the same time, "crop factor" may not be appropriate to describe very small sensors because the image is not necessarily cropped out (when using lenses designed for that sensor). An implication of this is that if one requires the subject to occupy the same fraction of the image on a 35 mm camera as using a 200 mm f/2.8 lens on a camera with a 1.5X crop factor (requiring a 300 mm f/2.8 lens), one would have to carry 3.5X as much weight! This also ignores the size difference between the two, which may be important if one does not want to draw attention in public. Additionally, heavier lenses typically cost much more. For SLR cameras, larger sensor sizes result in larger and clearer viewfinder images, which can be especially helpful when manual focusing. However, these will also be heavier and cost more because they require a larger prism/pentamirror to transmit the light from the lens into the viewfinder and towards your eye. As sensor size increases, the depth of field will decrease for a given aperture (when filling the frame with a subject of the same size and distance). This is because larger sensors require one to get closer to their subject, or to use a longer focal length in order to fill the frame with that subject. This means that one has to use progressively smaller aperture sizes in order to maintain the same depth of field on larger sensors. The following calculator predicts the required aperture and focal length in order to achieve the same depth of field (while maintaining perspective). *If the same perspective is desired. As an example calculation, if one wanted to reproduce the same perspective and depth of field on a full frame sensor as that attained using a 10 mm lens at f/11 on a camera with a 1.6X crop factor, one would need to use a 16 mm lens and an aperture of roughly f/18. Alternatively, if one used a 50 mm f/1.4 lens on a full frame sensor, this would produce a depth of field so shallow it would require an aperture of 0.9 on a camera with a 1.6X crop factor — not possible with consumer lenses! A shallower depth of field may be desirable for portraits because it improves background blur, whereas a larger depth of field is desirable for landscape photography. This is why compact cameras struggle to produce significant background blur in portraits, while large format cameras struggle to produce adequate depth of field in landscapes. Note that the above calculator assumes that you have a lens on the new sensor (#2) which can reproduce the same angle of view as on the original sensor (#1). If you instead use the same lens, then the aperture requirements remain the same (but you will have to get closer to your subject). This option, however, also changes perspective. 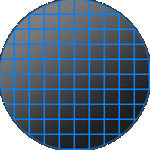 Larger sensor sizes can use smaller apertures before the diffraction airy disk becomes larger than the circle of confusion (determined by print size and sharpness criteria). This is primarily because larger sensors do not have to be enlarged as much in order to achieve the same print size. As an example: one could theoretically use a digital sensor as large as 8x10 inches, and so its image would not need to be enlarged at all for a 8x10 inch print, whereas a 35 mm sensor would require significant enlargement. Use the following calculator to estimate when diffraction begins to reduce sharpness. 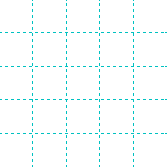 Note that this only shows when diffraction will be visible when viewed onscreen at 100% — whether this will be apparent in the final print also depends on viewing distance and print size.  To calculate this as well, please visit: diffraction limits and photography. An important implication of the above results is that the diffraction-limited pixel size increases for larger sensors (if the depth of field requirements remain the same). This pixel size refers to when the airy disk size becomes the limiting factor in total resolution — not the pixel density. Furthermore, the diffraction-limited depth of field is constant for all sensor sizes. This factor may be critical when deciding on a new camera for your intended use, because more pixels may not necessarily provide more resolution (for your depth of field requirements). In fact, more pixels could even harm image quality by increasing noise and reducing dynamic range (next section). Larger sensors generally also have larger pixels (although this is not always the case), which give them the potential to produce lower image noise and have a higher dynamic range. Dynamic range describes the range of tones which a sensor can capture below when a pixel becomes completely white, but yet above when texture is indiscernible from background noise (near black). Since larger pixels have a greater volume — and thus a greater range of photon capacity — these generally have a higher dynamic range. Furthermore, larger pixels receive a greater flux of photons during a given exposure time (at the same f-stop), so their light signal is much stronger. For a given amount of background noise, this produces a higher signal to noise ratio — and thus a smoother looking photo. This is not always the case however, because the amount of background noise also depends on sensor manufacturing process and how efficiently the camera extracts tonal information from each pixel (without introducing additional noise). In general though, the above trend holds true. Another aspect to consider is that even if two sensors have the same apparent noise when viewed at 100%, the sensor with the higher pixel count will produce a cleaner looking final print. This is because the noise gets enlarged less for the higher pixel count sensor (for a given print size), therefore this noise has a higher frequency and thus appears finer grained. The cost of a digital sensor rises dramatically as its area increases. This means that a sensor with twice the area will cost more than twice as much, so you are effectively paying more per unit "sensor real estate" as you move to larger sizes. One can understand this by looking at how manufacturers make their digital sensors. Each sensor is cut from a larger sheet of silicon material called a wafer, which may contain thousands of individual chips. Each wafer is extremely expensive (thousands of dollars), therefore fewer chips per wafer result in a much higher cost per chip. Furthermore, the chance of an irreparable defect (too many hot pixels or otherwise) ending up in a given sensor increases with sensor area, therefore the percentage of usable sensors goes down with increasing sensor area (yield per wafer). Assuming these factors (chips per wafer and yield) are most important, costs increase proportional to the square of sensor area (a sensor 2X as big costs 4X as much). Real-world manufacturing has a more complicated size versus cost relationship, but this gives you an idea of skyrocketing costs. This is not to say though that certain sized sensors will always be prohibitively expensive; their price may eventually drop, but the relative cost of a larger sensor is likely to remain significantly more expensive (per unit area) when compared to some smaller size. Some lenses are only available for certain sensor sizes (or may not work as intended otherwise), which might also be a consideration if these help your style of photography. One notable type is tilt/shift lenses, which allow one to increase (or decrease) the apparent depth of field using the tilt feature. Tilt/shift lenses can also use shift to control perspective and reduce (or eliminate) converging vertical lines caused by aiming the camera above or below the horizon (useful in architectural photography). Furthermore, fast ultra-wide angle lenses (f/2.8 or larger) aren't as common for cropped sensors, which may be a deciding factor if needed in sports or photojournalism. Depth of field is much shallower for larger format sensors, however one could also use a smaller aperture before reaching the diffraction limit (for your chosen print size and sharpness criteria). So which option has the potential to produce the most detailed photo? Larger sensors (and correspondingly higher pixel counts) undoubtedly produce more detail if you can afford to sacrifice depth of field. On the other hand, if you wish to maintain the same depth of field, larger sensor sizes do not necessarily have a resolution advantage. Furthermore, the diffraction-limited depth of field is the same for all sensor sizes. In other words, if one were to use the smallest aperture before diffraction became significant, all sensor sizes would produce the same depth of field — even though the diffraction limited aperture will be different. Technical Notes: This result assumes that your pixel size is comparable to the size of the diffraction limited airy disk for each sensor in question, and that each lens is of comparable quality. Furthermore, the tilt lens feature is far more common in larger format cameras — allowing one to change the angle of the focal plane and therefore increase the apparent DoF. Another important result is that if depth of field is the limiting factor, the required exposure time increases with sensor size for the same sensitivity. This factor is probably most relevant to macro and nightscape photography. Note that even if photos can be taken handheld in a smaller format, those same photos may not necessarily be taken handheld in the larger format. On the other hand, exposure times may not necessarily increase as much as one might initially assume, because larger sensors generally have lower noise (and can thus afford to use a higher sensitivity ISO setting while maintaining similar perceived noise). Ideally, perceived noise levels (at a given print size) generally decrease with larger digital camera sensors (regardless of pixel size). 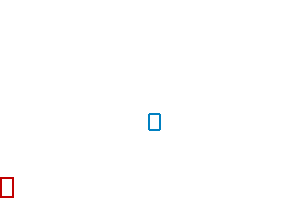 Technical Notes: This all assumes that differences in microlens effectiveness and pixel spacing are negligible. If pixel spacing has to remain constant (due to read-out and other circuitry on the chip), then higher pixel densities will result in less light gathering area unless the microlenses can compensate for this loss. Additionally, this ignores the impact of fixed pattern or dark current noise, which may vary significantly depending on camera model and read-out circuitry. Overall: larger sensors generally provide more control and greater artistic flexibility, but at the cost of requiring larger lenses and more expensive equipment. This flexibility allows one to create a shallower depth of field than possible with a smaller sensor (if desired), but yet still achieve a comparable depth of field to a smaller sensor by using a higher ISO speed and smaller aperture (or when using a tripod).